When playing games, children have an incredible capacity to be creative. Children have freedom to be themselves in the playground. They often have their own for games or they find ways to make them more cooperative. Games are a fun way to practise English – it can be a really motivating way to learn a language!!! On March 6th, 1st and 2nd graders participated in the play "Little Red Riding Hood". It was really fun to follow the famous story in English. We were carefully understanding the tale and participating in the performance and songs. Little Red Riding Hood did a good job with her grandmother and the bad wolf ended up in a shopping bag. Ja fa mesos, en Halloween, els nens de 3r van representar una petita obra de teatre trilingüe (en català, castellà i anglès), però ens vam descuidar de penjar-la al blog! Aquí la teniu per fi. I like .../ I love. Us desitgem un Bon Nadal i un Feliç Any Nou!!! 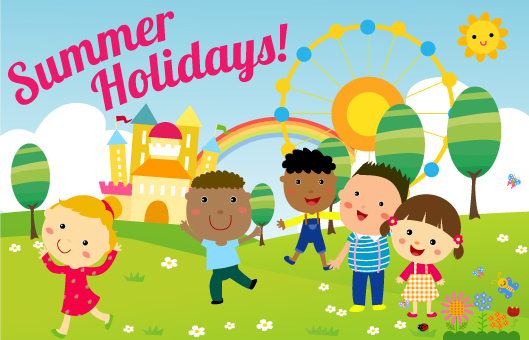 WELCOME SCHOOL NEW YEAR 2018-19 Did you have good summer holidays? We hope so!